In the world of action cameras, GoPro undoubtedly makes some of the best tools for the job, but they don’t come cheap. Its latest lineup can cost you anywhere between Rs. 28,000 and Rs. 38,000 in India. Online stores do sell GoPro gear for less, but it’s still a big investment. Sensing an opportunity, Chinese brands have also flooded the market with GoPro knock-offs, and SJCAM is one of the more popular names. 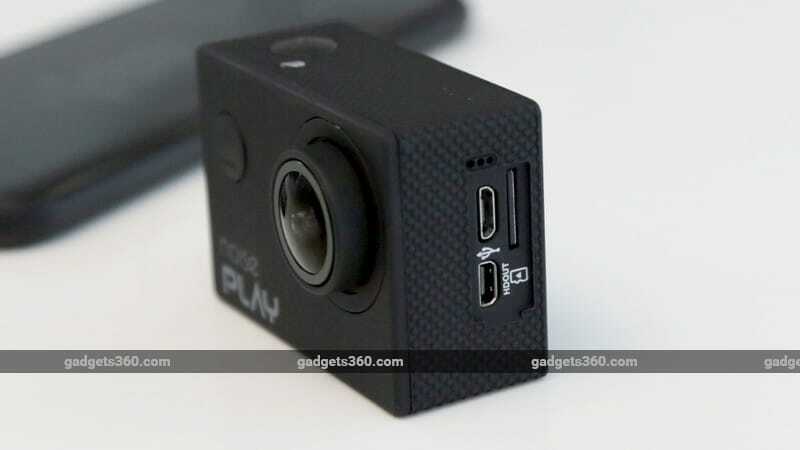 Now, a Gurgaon-based company called Noise aims to tap into the affordable action camera market, with a product called the Noise Play. This is its first venture into the action camera segment, as its current portfolio consists of smartwatches and smartphone cases. 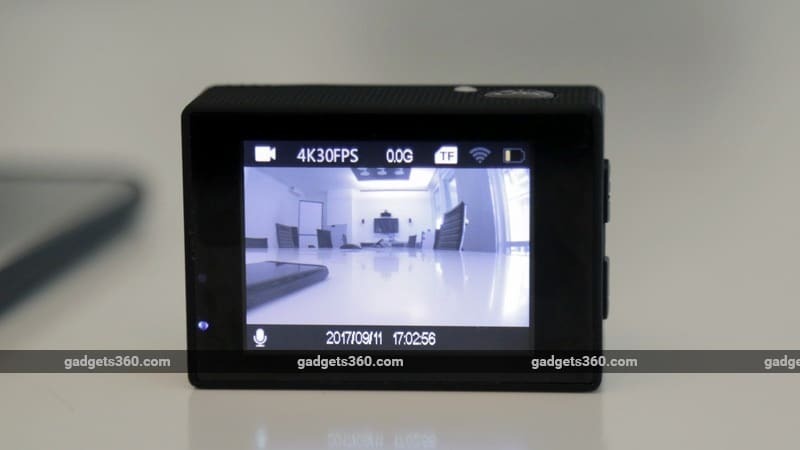 The Noise Play is a very interesting product as it offers 4K video recording at a price of just Rs. 6,990. This makes it an ideal candidate for someone looking to get their feet wet in the action camera space without having to spend a whole lot. Let’s see how it fares. 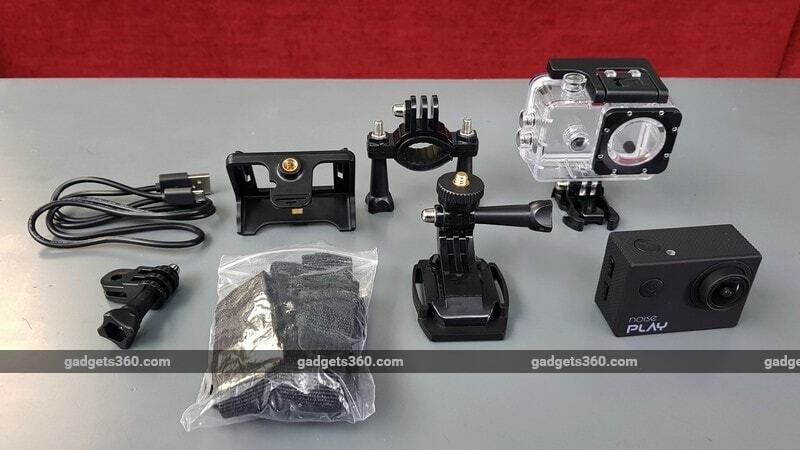 The Play looks similar to other Chinese GoPro competitors, and it is manufactured in China as well. It has the same basic design and layout as GoPro’s Hero4 series of cameras. The body of the Noise Play is built completely out of plastic, and the quality and finish are fairly average, which is what you would expect at this price point. The front has a soft rubber texture while the sides have a textured plastic grip. There’s a 2-inch LCD display at the back which can be used to frame shots and shows you which shooting mode is currently active. It's nice to have a display at this price, as most notable alternatives seem to lack one. The quality of the screen on the Noise Play is decent but it washes out when used outdoors under sunlight. Viewing angles are quite weak, and in order to see everything on the screen clearly, you need to be looking at it at a slight angle rather than straight on. The protective panel over the display is quite flimsy too, so even slight pressure causes it to warp. Since it’s not a touchscreen, you have buttons to navigate the menu and change settings. There’s a blue and red LED at the back for power and charging status, and another LED just next to the shutter release button on the top, for Wi-Fi. We have navigation buttons at the side for when you’re in the menu. The Up arrow is also a shortcut for toggling Wi-Fi when you’re connecting the camera to a smartphone. The button on the front lets you power the camera on and is used for switching modes. The left side has a slot for a microSD card (up to 32GB), a Micro-USB port, and a Micro-HDMI port, but unfortunately, there's no protective covering over them. The 1050mAh battery sits at the bottom and is removable. However, the flap for the compartment isn’t attached to the camera so it is possible to lose it if you’re not careful. You get plenty of accessories with the camera to get you started, including a waterproof housing, a bicycle mount, a base mount, a tripod mount, two adhesive support strips, two wrist straps, two Velcro support straps, a pivot joint, a cleaning cloth and a Micro-USB cable. The quality of accessories is decent and they work well. The Play packs in a 16-megapixel Sony sensor with a 170-degree wide-angle lens. Photos are shot in the JPEG format while videos are recorded as MP4 files. The camera lets you cycle through three shooting modes, which are Video, Photo and Slow-motion. The next mode is Playback, followed by the Settings. 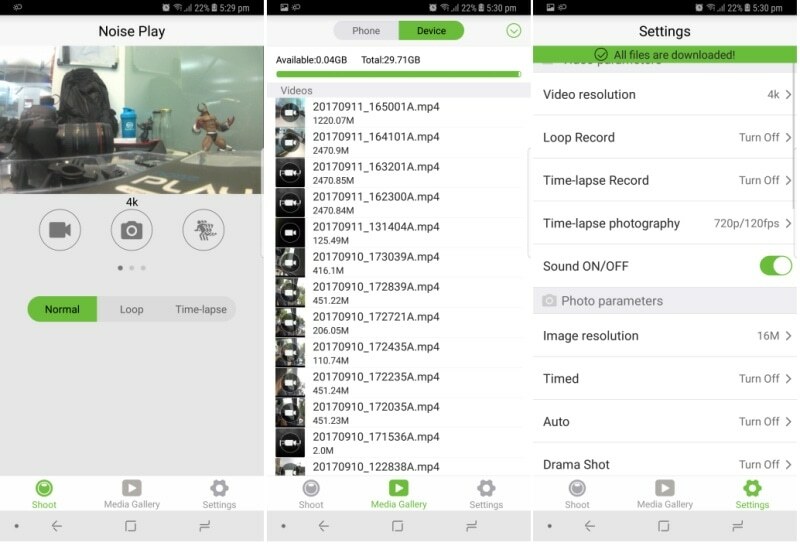 Within each mode, you can activate other controls, so for instance in video, you can set the camera to shoot a standard video or enable loop recording (with 2, 3 or 5 minute intervals), or time-lapse video (with intervals ranging from 0.5 sec to 30 sec). The resolution you set applies to all these sub-modes in the video section, and the choices range from 4K at 30fps to 720p at 120fps. You can even choose to disable audio recording if needed. In the photos mode, you can change the image resolution and set a self-timer. Auto-shoot automatically takes a picture after the set interval, and burst mode can capture up to 10 frames per second. For slow-motion video, you just have a choice between 1080p at 60fps and 720p at 120fps. The general settings let you change the date and time, format the microSD card, and choose the interface language. The Noise Play can be controlled via an iOS or Android app which has the same name. The camera needs to be connected to your device using Wi-Fi and you'll need to use its Settings app because if you try and do it through the app directly, it doesn’t work. The first tab of the app lets you switch shooting modes and makes it easier to change settings. The second tab lets you browse through the footage you’ve shot on the camera and import files. The app works the same on Android and iOS. Setting up the Noise Play is just a matter of inserting a microSD card. You just have to do that and you’re pretty much ready to go. We used a 32GB Class 10 (UHS-1) card for our test. The display is visible in most lighting conditions, except in bright sunlight, where it pretty much washes out. There’s also no way to adjust its brightness level. Video is shown in the 16:9 aspect ratio so the black bars above and below it are used to show which mode you’re in, the video or photo resolution, the free space on the microSD card, the battery level, and whether audio is being recorded or not. However, some accessories like the camera mount block the status LEDs on the back so you can't tell if the camera is recording or not. Also, there's not no way of knowing the recording status if you mount the camera facing you, since there aren't any indicators on the front. The bicycle mount can be used on a motorbike too, but the rubber one the clamp is loose and it keeps flopping out of place when trying to set it up. Also, since the rubber lining is thin, it doesn't soak up vibrations very well. In daylight, 4K video quality is pretty decent, with nearby objects in good focus. However, the sensor has a tough time metering scenes, and bright areas are perpetually burnt out. This is true for stills as well. We also noticed that intermittently, footage gets garbled for a second or two but then straightens out again. This happened a few times at 4K but things were better at 1080p. When shooting at full-HD 60fps, footage is smooth and the camera manages good details in nearby objects, although we found that footage was over-sharpened a bit. Colours are handled decently well but light metering is still an issue. The field of view is fixed, but thankfully, barrel distortion isn’t a very big problem. At night, image quality takes a severe hit. Focus is soft and details are mushy. In video, objects that aren't in the centre of the frame appear quite fuzzy. The built-in microphone does an okay job of picking up audio but only when it isn't covered by accessories. With the waterproof housing, there’s a severe reduction in audio recording quality - only really close or loud sounds are audible, and that too, very faintly. Thankfully, the camera doesn't heat up too much even when used in its waterproof case. Daylight stills look good, as long as you don’t zoom in or crop them too much. Colours are rendered decently too. The camera offers basic adjustments like the ability to change the exposure and white balance. At night, image quality is below average. Details are often lost and colours aren’t accurate. In timelapse videos, we noticed a slight shimmer effect in stationary objects at 4K resolution, which ideally shouldn’t happen. Slow-motion video is also decent. Battery life is average and could be better. With continuous 4K recording, the Noise Play lasts for about 40 minutes, but we managed to get a little more at lower resolutions. With Wi-Fi on, the battery drains a lot quicker as is the case with most action cameras. We also noticed at times that just playing around in the Settings for a bit would knock a bar off the battery meter. It takes a few hours to fully charge the camera. As a beginner-level action camera, the Noise Play is not a bad place to start. It has a decent set of features like 4K video recording and a display. We also like that it comes with a useful set of bundled accessories to get you started. However, in order to achieve such a low price, certain compromises have had to be made. The build quality of camera, for instance, doesn't inspire too much confidence. Video and photo quality in low-light is very weak, and even in daylight, the camera struggles to judge the light in scenes correctly, leaving you with bright, overblown patches in some frames. As a first attempt, the Noise Play is a commendable effort. However, if you're looking to get better quality footage at this price (and why shouldn't you), then the Yi Action Camera should offer better results.